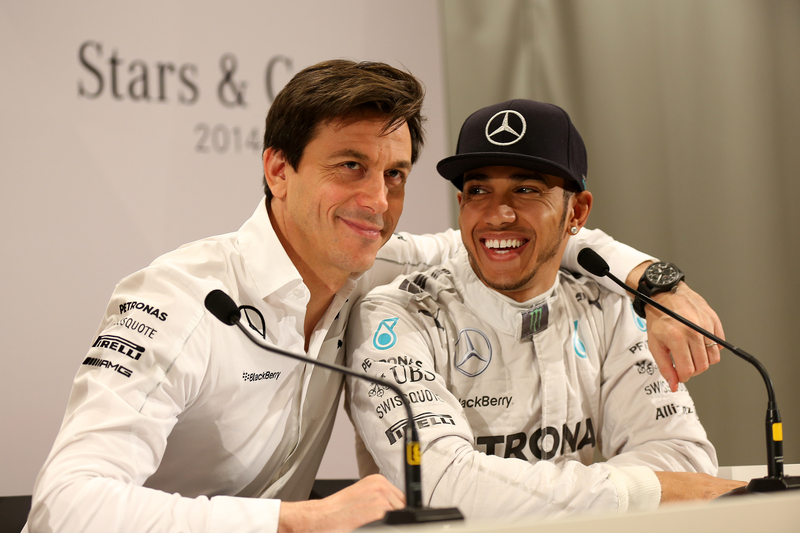 Hamilton with Mercedes team boss Toto Wolff. © MERCEDES AMG PETRONAS Formula One Team. It is incredibly difficult to fault much of Lewis Hamilton’s world championship winning performance in 2014. Now a seemingly far more mature animal than the man who claimed a first title in 2008, Hamilton surged to win eleven of the nineteen Grand Prix; however the Briton was kept in check for the duration by championship rival and Mercedes teammate Nico Rosberg. Like last year, the 2014 season showed Hamilton and Rosberg were far closer in terms of performance than initially expected, but with the distinct advantage held by the W05 machine, the stakes grew significantly. Many commentators expected Hamilton to ratchet up the poles, with Rosberg playing the intelligent racer. That the opposite became the norm gave a glimpse into how Hamilton has developed since his early days at McLaren. But maybe perhaps we should not have been surprised. When partnered by Jenson Button at the Woking squad for three seasons from 2010, Hamilton then surprised critics as he displayed an ability to manage initially the strong Bridgestone’s and then the ultra delicate Pirelli tyres with aplomb. With such consistency and maturity, it is no surprise that of all the sixteen races that Hamilton finished, he was never once off the podium. There were even a pair of 3rd place finishes when starting toward the back in Germany and Hungarian following a car problems. Additional mechanical failures Melbourne and Montreal took the Briton out of both races while Rosberg scored big, doing much to put Hamilton under pressure. Without doubt, the nadir of Hamilton’s season came at Spa-Francorchamps, when a contentious clash between he and Rosberg at the entry into Les Combes on lap two punctured the former’s left rear tyre. It was a clumsy error on Rosberg’s part; although those with agendas still contend it was a deliberate action, but Hamilton’s desire to push hard back to the pits as a quickly as possible only served to add damage to his Mercedes. From there, the season was dominated by Hamilton. Six wins in the final seven races – including a string of five victories from Monza to Austin – put the title well beyond Rosberg, although the latter’s mechanical issues in the Abu Dhabi finale made it a foregone conclusion regardless. There are those who may point to W05 as being the dominant reason for Hamilton’s 2nd title, but that would be churlish. Hamilton will turn 30-years-old next year and as he hits his stride, this success could potentially lay the foundations for a period of dominance similar to that experienced by Sebastian Vettel and Michael Schumacher in recent years.